Did you ever expect a tropical island in Southeast Asia to get close to freezing? Neither did I. Here’s how I lived through one of the coldest snaps (not happily I might add) that Hong Kong’s seen in recent years. 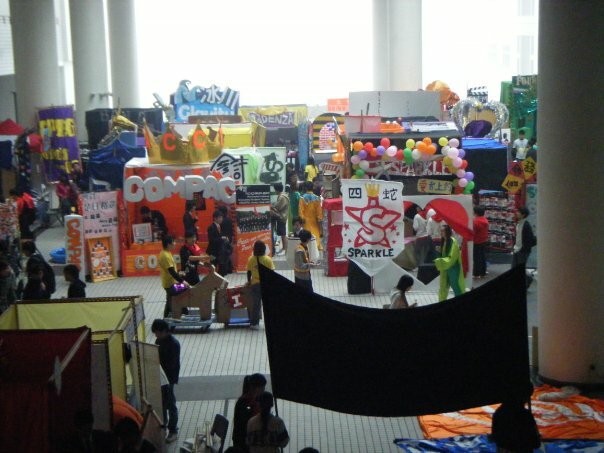 A bird’s-eye view of some of the student clubs campaigning for new members. It was like a carnival everyday! It was just so bitterly cold and miserable that my roommate actually broke down and bought a heater (we named him “Bruce” – he just looked like one, what else can I say) for our room because NO ONE in Hong Kong actually had central heating! It’s completely crazy, I know! Our dorm rooms (and the entire school really) didn’t have any kind of heat system. Everyone was bundled in multiple layers all the time, and still not really warm. Thankfully, that Sunday the cold snap finally broke (somewhat) and it became what felt like a balmy 55-60 degrees Fahrenheit. Now down to the business of what mischief I managed despite the frigid temperatures. 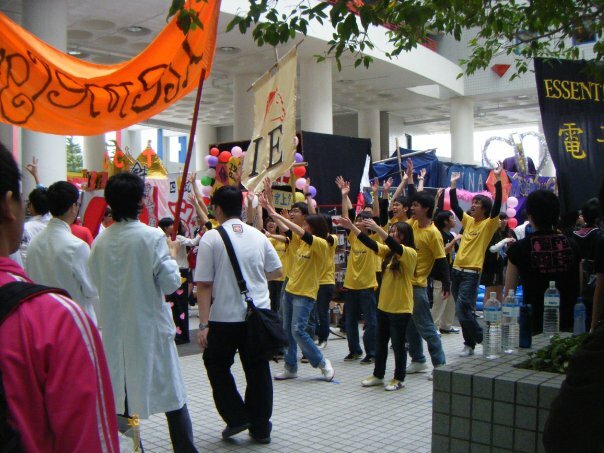 Students from a club performing a choreographed dance to attract new members. Good luck, guys. Before I forget, let me ask if you’re familiar with club campaigning at universities in Asia? It’s similar to field days where clubs stake out spots and promote what they’re about to gain new members, but HKUST took it to a whole new level never before witnessed. For two full weeks, student clubs filled every available atrium shouting, cajoling and doing all they could to gain new members. They had games, prizes, snacks, bull horns, full-size dioramas and even synchronized cheers and songs to try to attract attention to themselves and their cause. The din could get deafening, especially when two clubs got into a shouting match with each other, but it was entertaining at the same time. I wasn’t sorry to see the campaigning period end, but it was an experience I’ll never forget, and I applaud the students’ continuing tenacity throughout. It never seemed to flag. And after that little segue, back to my main story. On Wednesday, I went on a wild goose chase to pick up my first package in Hong Kong from the HK Postal Service. At the university we only had mail slots big enough for cards and small-sized packages, but as my parents were kind enough to pay the exorbitant shipping fees of international shipping, I received only a notification (mostly in Chinese characters) telling me which post office I needed to take the mini bus and MTR (HK’s highly efficient subway system) to retrieve the package – or so I thought. 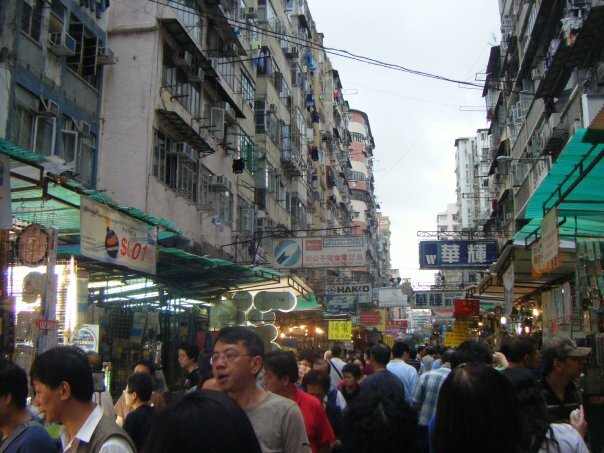 So I set off for the Tseung Kwan O Post Office on a day I had no morning classes, and after arriving at the Tseung Kwan O MTR station I proceeded to wander around for half an hour, asking directions to the post office. When I finally found it, thinking my search was at an end, I was told that, no, my package wasn’t there. Huh?? It was actually back at the Hang Hau Post Office – the very same MTR stop I had left to get to Tseung Kwan O!! In very teeny, weeny, tiny print underneath the large Tseung Kwan O Post Office stamp it said in barely readable English Han (no “G” to be seen) Hau Shopping Mall for the Hang Hau Post Office’s location! Seriously?! Frustration doesn’t even begin to describe what I was feeling at that point. After a nearly two-hour roundabout trip, I did manage to get my package (so very much appreciated – it contained long-sleeved shirts, a heavier jacket and more pairs jeans) and get back to campus. Thank goodness my Wednesday classes weren’t until the afternoon. 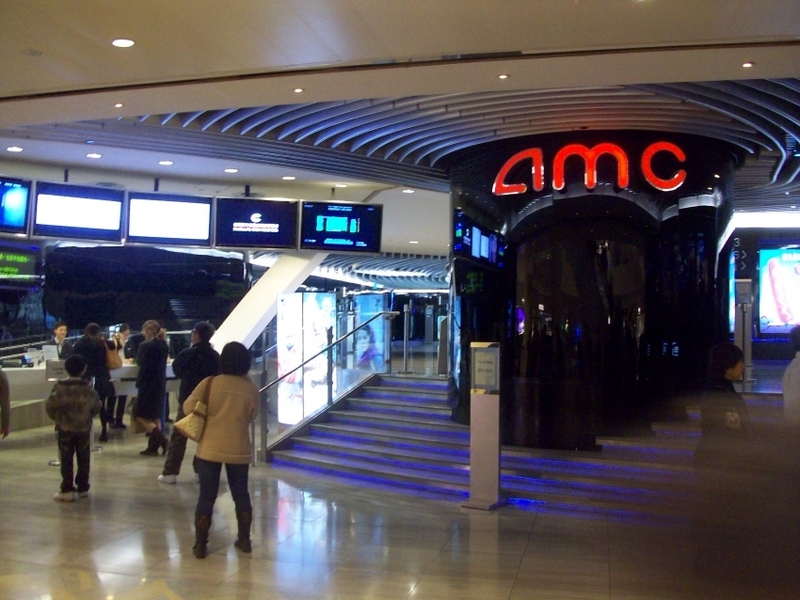 The AMC Theater in Kowloon Tong shopping center where we saw the movie. Just like home. On Thursday night, after everyone was done with classes, a group of exchange students decided to go to the movies to alleviate our growing boredom from being cooped up indoors while staying out of the continuing cold weather. We went to see “Valentine’s Day,” and the great thing is that all the English movies are still screened in English in Hong Kong, but they just add Cantonese subtitles in lieu of dubbing. Can you imagine trying to match mouth flaps while dubbing in Cantonese or Mandarin? It would look at least as cheesy as the badly dubbed kung fu movies over here in the US! So all of the English speakers in the audience ignored the subtitles and enjoyed the movie just as we would have at home. One big difference in seeing a movie in Hong Kong, though is that you bought your ticket ahead of time online and you actually chose your movie seat then as well (how very orderly and civilized of them). There were actually people in the theater who would spot check to make sure you were sitting in your assigned seat just like at a live theater production or sporting event in the States. My friends and I all sat in our assigned seats (we filled up a whole row actually), but some people ahead of us, took seats that weren’t theirs and the ticket Nazi actually made them move because the seat holders with those tickets showed up. No one was caned or tarred and feathered, but still – how embarrassing getting caught red-handed. The movie was fun though, and probably one of the most “American” things I’d done since arriving in Hong Kong. But truthfully, I was totally happy as many out of the ordinary experiences as I could while I was there – everything was an exciting, new adventure for me. Why do something I could do at home like see a movie? Almost all of Friday was dedicated to studying. I was really fortunate to not have any classes on Fridays, and so I spent a good deal of the day in the library doing homework, reading, and trying to get a little ahead in preparation for the many unforeseen homework distractions which cropped up on a regular basis during the week (these included but were not limited to: impromptu club outings, dinners, long coffee breaks, and venturing into the city on whims for bubble tea or other frivolous pursuits – basically anything that sounded more fun than studying). How could anyone not want to be in this throng living life instead of studying? Plus, it was still so cold outside; being anywhere other than my tiny, freezing room was a welcome option. That was also the night my roommate Katrin went out and bought the mini plug-in heater for our room, Bruce (bless her!). After that, we had the best room on campus, and I invited a bunch of people over after dinner to watch a movie without freezing to death. We watched “2012,” which was beyond corny (and had lovely Russian subtitles courtesy of a bootlegger), but with friends to make fun of it and cookies from the local mini-mart it was still a great way to spend a Friday night. Nothing much got done on Saturday, more homework, a small birthday celebration that night, but nothing too groundbreaking. The lack of sunlight and warmth made everyone (myself included) more lethargic and less inclined to do anything – we were like hibernating animals minus the fur coats. 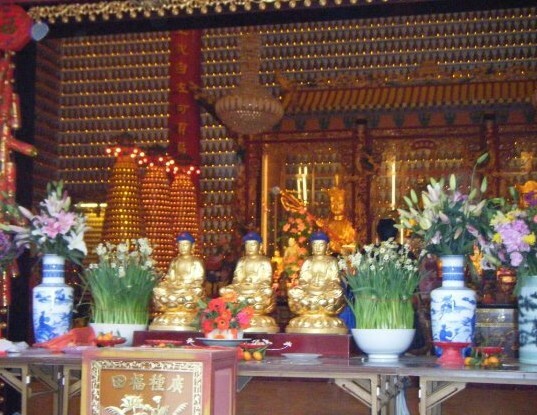 Tens of thousands of tiny Buddha statues lined the walls of this temple floor to ceiling. Sunday, however, was another story. As the weather warmed up, a group of us went to Sha Tin (about a half hour ride by MTR) to see the Ten Thousand Buddha Temple. It was a hilly climb up the side of a mountain and was literally lined with 10,000 Buddhas! They were mostly painted gold, but there are also ones in full color, one Buddha with arms where its eyes should have been (don’t ask me why, no one could figure that out), and two different temples where the Buddhas were miniaturized and stacked one on top of another all the way up to the ceiling. And they lined every wall! 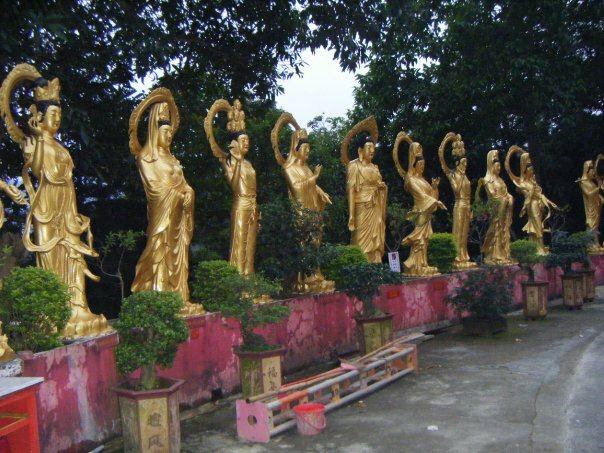 I’ve never seen so many Buddha statues of varying size and shape anywhere! It was definitely worth the trip, and as we were coming back down from the top of the hill, we encountered a group of wild monkeys! Two adults and two babies were jumping from Buddha to Buddha, running along the path in front of us, tearing open juice boxes that had been offered up as gifts earlier in the day and doing what monkeys do. My friend told me that monkeys there are like squirrels to us in the US; just commonplace. For us foreigners though it was amazing, and we could get quite close to them before they would run up a tree or out of reach! That alone, was worth making the steep hike up the Buddha trails. 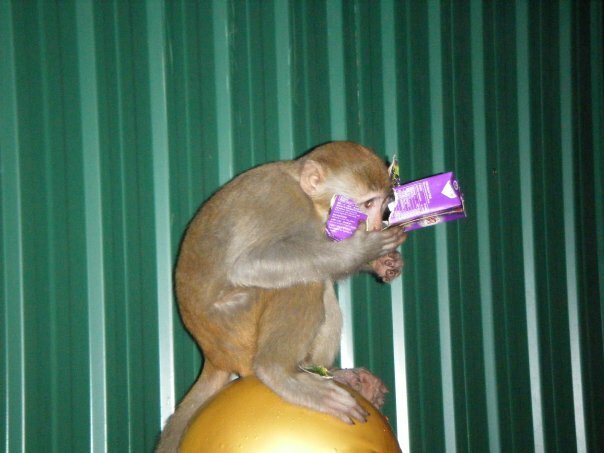 One of the wild monkeys tearing into a juice box. After that fun excursion, things settled down a bit. Classes became slightly more demanding, so I met people to work on group homework / goof off for some courses, I had my first couple of quizzes that week and a guest lecturer for my strategic marketing class on Thursday night (she was the VP of the Asian region for Intel), and life was generally more school-like – more like what I was anticipating before I got to Hong Kong and discovered the real learning that semester would take place outside the classroom walls. My friend from Italy, Pietro finally found out that week that he’d been accepted into London’s Cass Business School for his graduate program in business management the next year, and he (and we too) couldn’t have been more thrilled by it. It was his first choice, and he’d been waiting on pins and needles for ages to get an answer from them. This success called for a beer from the local campus bar that evening. Yeah – did I forget to mention HKUST actually has a BAR on campus? Talk about convenient! Just wait for the update next week; my friends and I had our first trip to mainland China (Shenzhen and Guangzhou) planned, and it made Hong Kong look positively idyllic by comparison! 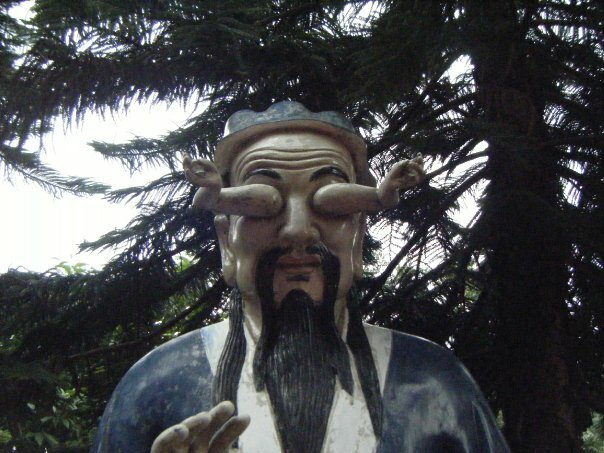 The Buddha I mentioned with legs for eyes. Super freak! A sampling of the many thousands of Buddhas lining the path as we climbed to the top. 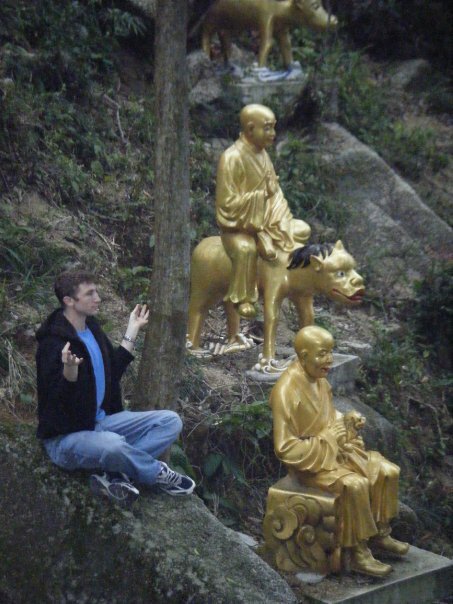 My friend Richard getting in touch with his inner Zen master. This entry was posted in Asia, Hong Kong and tagged Asia, Buddhas, Cold, HKUST, Hong Kong, Movie, Travels on March 2, 2014 by Paige N..